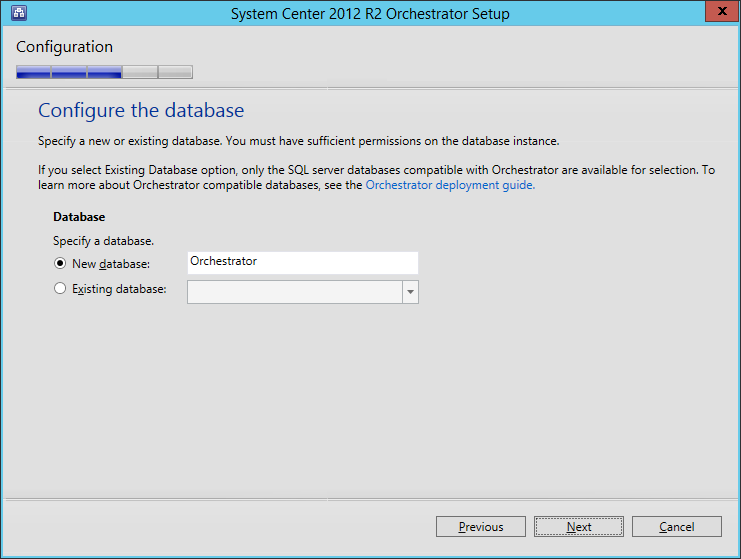 These have been setup as per my previous guides for the OS and SQL setup. IMPORTANT: In order to evaluate the System Center Technical Preview, you MUST be using the Windows Server Technical Preview, and SQL Server 2014; as per the following TechNet article: http://technet.microsoft.com/en-us/library/dn806369.aspx. Start by copying the EXE file into the SCORCH VM. 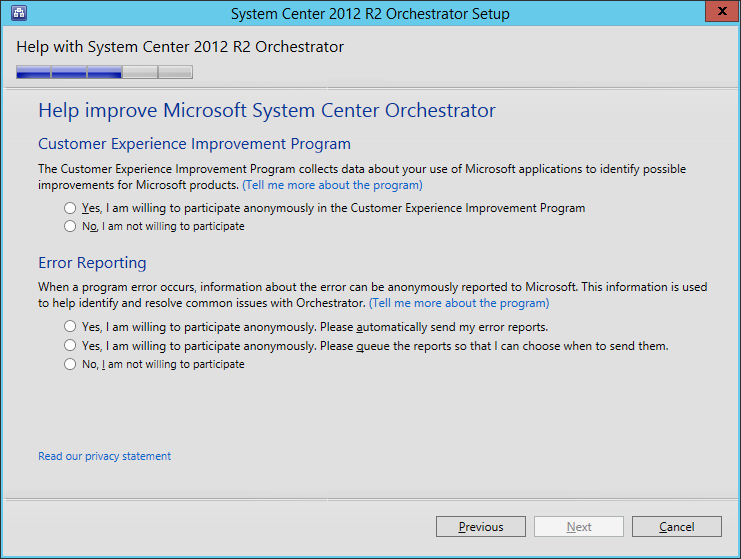 As of this writing, the Technical Preview EXE is labelled as “en_system_center_technical_preview_orchestrator_x86_x64_5650402.exe“. Start by running the EXE. 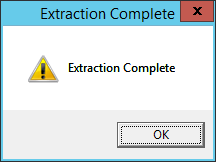 On the Directory screen, choose the location to extract the installation files, then click OK.
On the Extraction Complete dialog, click OK.
Once the files are extracted, start the installation by running SetupOrchestrator.exe. On the splash screen click the Install link. On the Product Registration screen, fill in the Name, Organization and Product Key fields, and click Next. 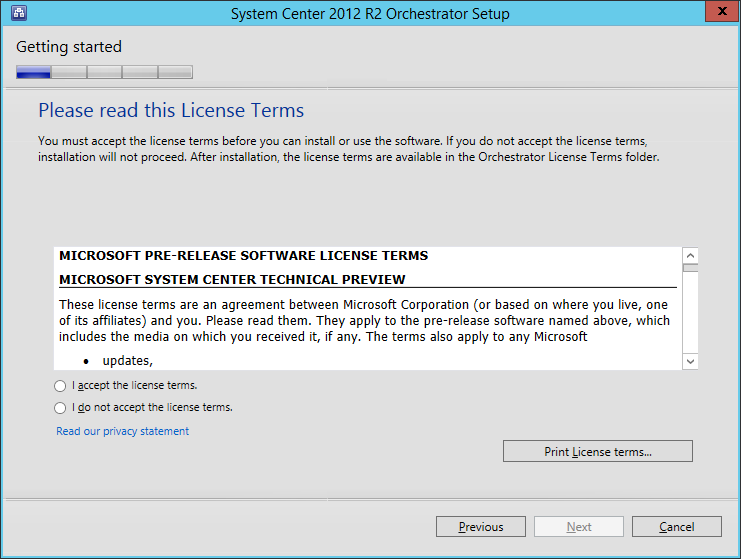 Read and accept the License Terms, and then click Next. On the Select Features screen, select what you want to install. In this lab example, we are installing all features onto the same server. 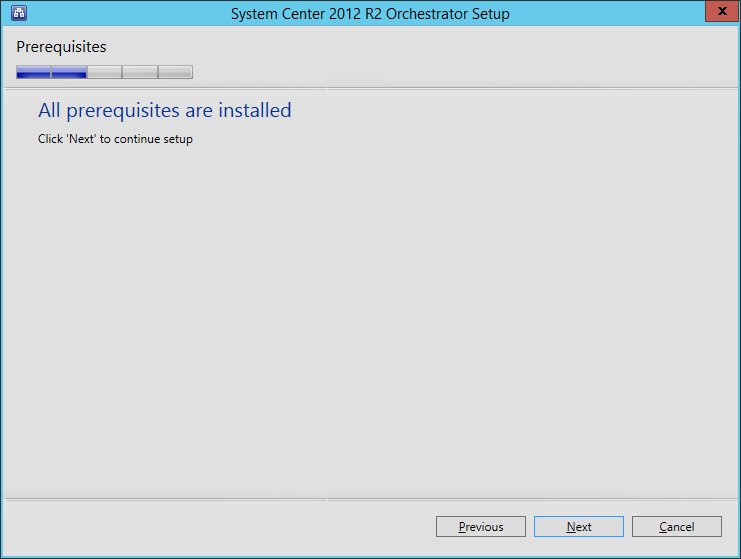 On the Prerequisites screen, if you are missing .NET and/or IIS, the installer can take care of it all for you. 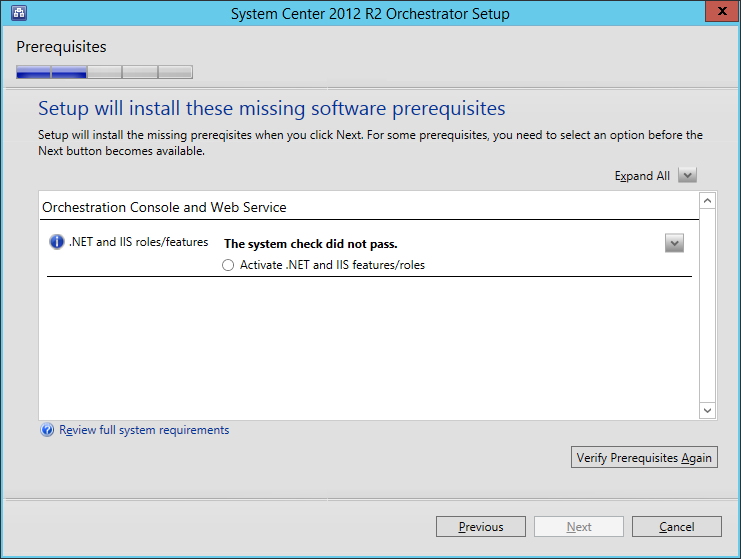 Just select the “Activate .NET and IIS features/roles” option, then click Next. Once all the prerequisites are installed, click Next. 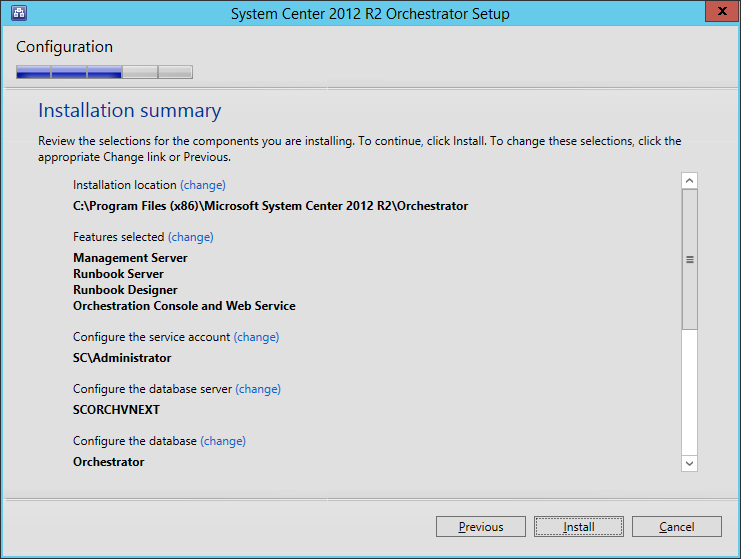 Next you need to provide a Service Account for running the Runbooks, and accessing remote systems. Note that the account must have “Log on as a service” rights. Enter the account details, and then click the Test button. Once the credentials have been tested successfully, you will be able to click Next. 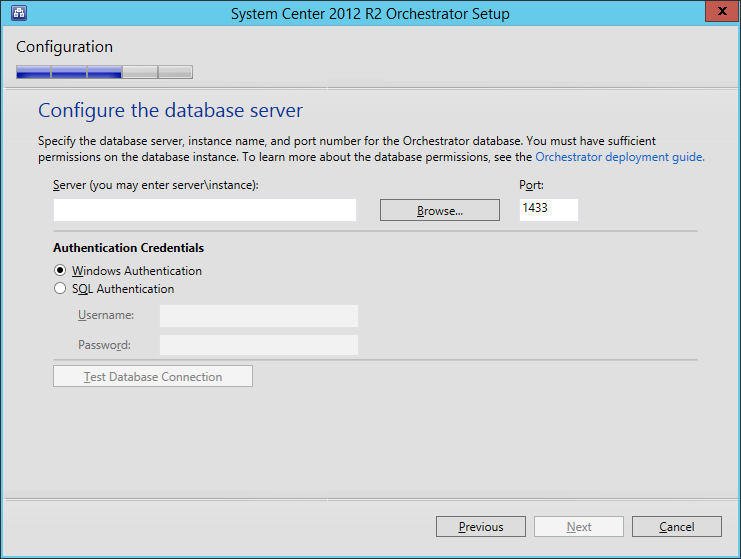 Now you need to configure the database. Provide the server and instance, and click the Test Database Connection button. Only once the database connection has been successfully tested will you be able to click the Next button. Now you can also specify the database name. In this lab example we will accept the defaults and click Next. 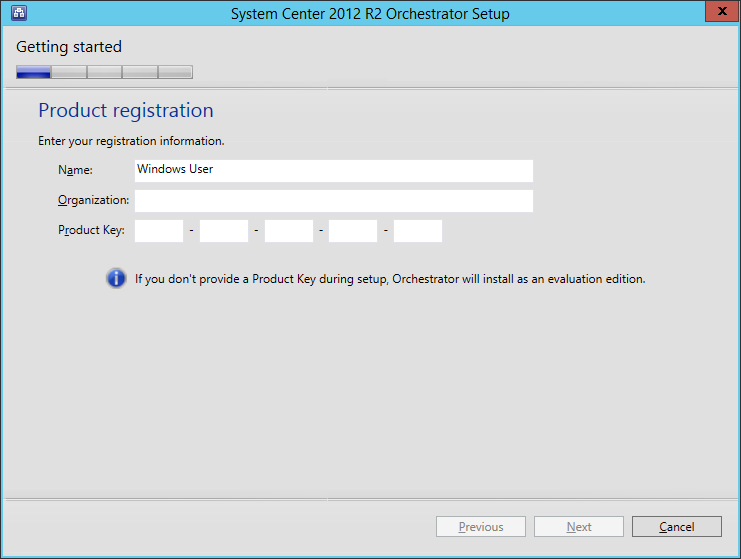 Now we need to configure the Orchestrator User Group. 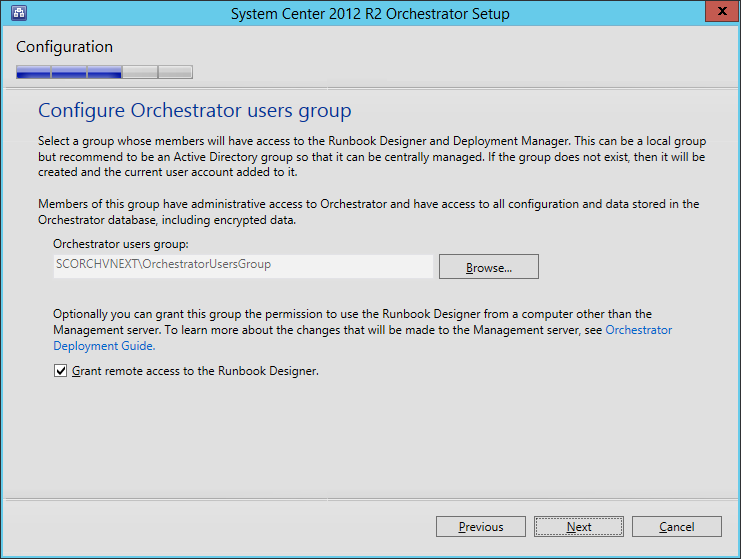 This group will have Administrative access to Orchestrator. 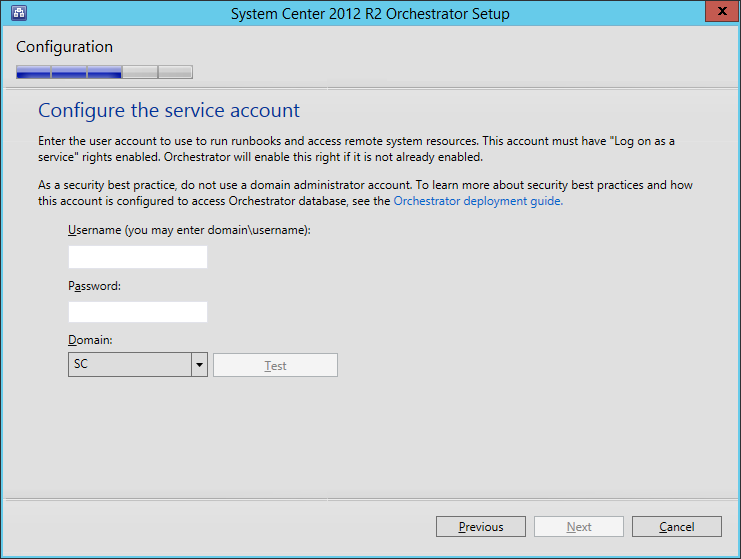 You can locate and use an existing Security Group from Active Directory. 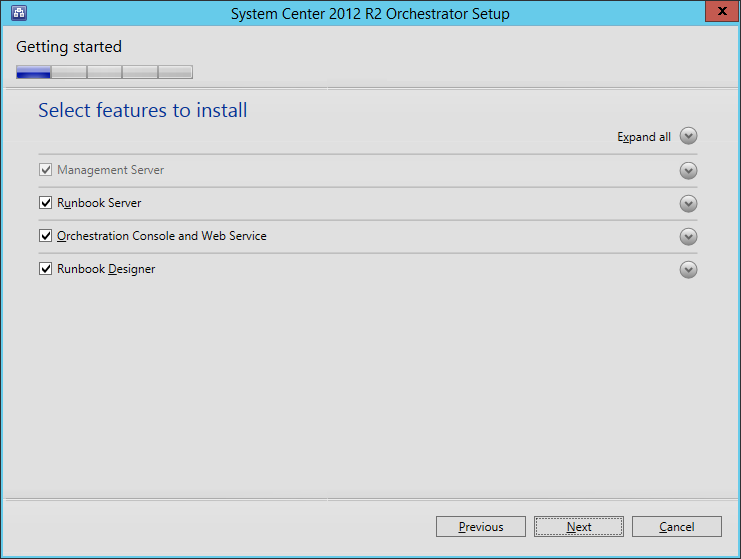 Specify a User Group and click Next. 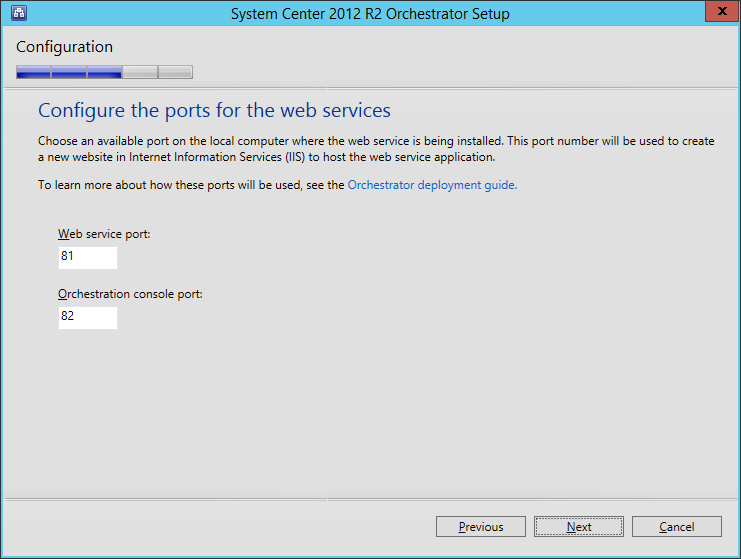 On the Web Services screen, you have the opportunity to change the ports used. For this lab example we will accept the defaults and click Next. 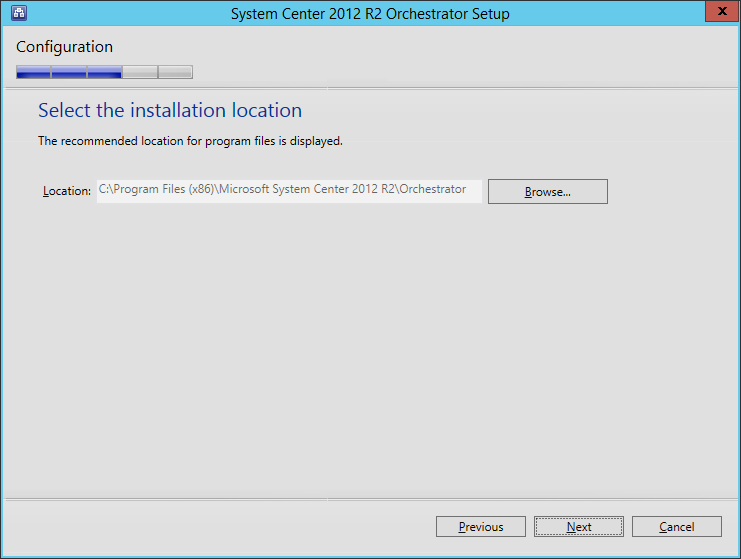 You can also change the installation location. For example, if you have a dedicated drive in the server for the Operating System, and a second drive for the middleware. Make the appropriate modifications if applicable, and then click Next. 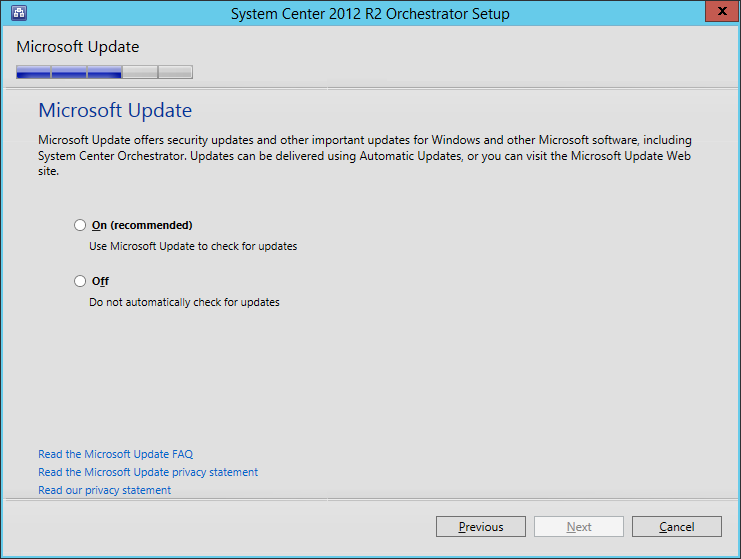 Just as in System Center 2012, you can use Microsoft Update to find updates for the product. In a Production environment, you would probably not want to do this, since there will more than likely be Change Management controls around updating/patching. In this lab example, I am not going to enable Microsoft Updates for the product, so that in the future I will be able to document the update/upgrade process in detail. Next, you can choose if you want to participate in the CEIP program. In a Production environment, this will probably not be accepted, as there may be some concern over private/personal data. In a lab/non-production environment though, I would personally choose to be a part of the program, because the information collected by Microsoft aids them in improving the product. If no one was willing to participate, then there would be no improvements. Finally, review the information on the Summary screen, and click Install. Once the installation is complete, you can select/de-select any of the listed checkboxes, and then click Close. 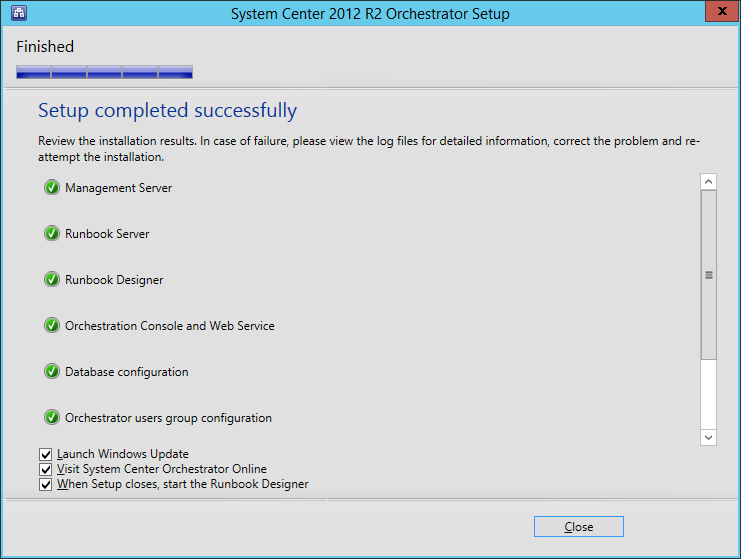 Congratulations, you have now successfully installed the System Center Orchestrator Technical Preview. 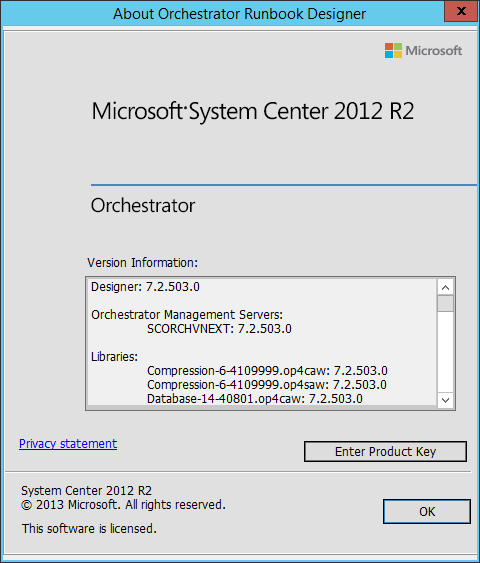 As you can see from the About screen, the version of SCORCH, even though it shows “System Center 2012 R2”, the version is: 7.2.503.0 (whereas the actual 2012 R2 product is version 7.2.84.0). At this point, I haven’t noticed anything new/different with the product. However, as the product is updated, I will keep you informed of any interesting and important changes. 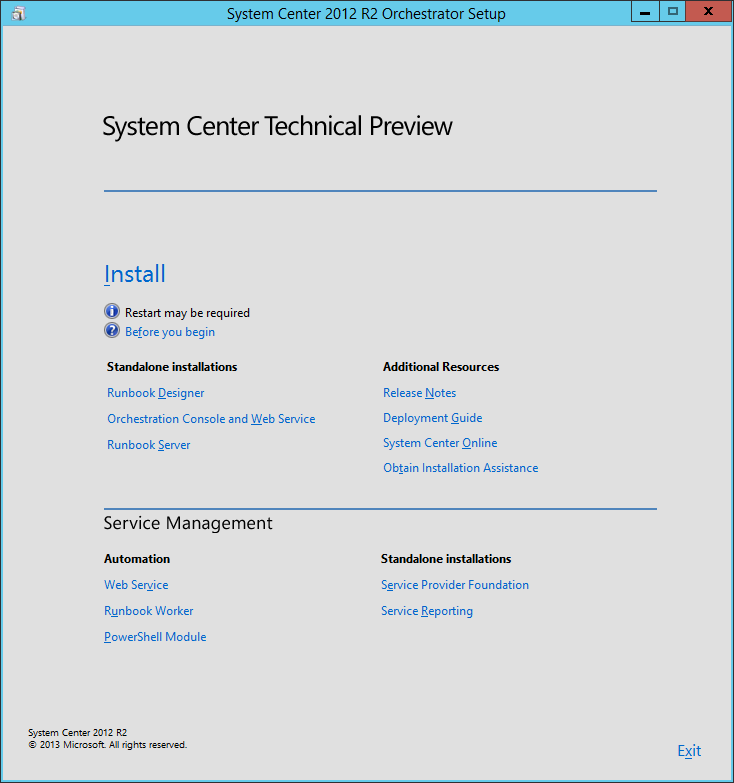 For further information about the System Center Technical Preview, here is the link to the Features Removed In System Center Technical Preview, and the Release Notes For System Center Technical Preview.